An unfortunate constant throughout my university journey has been problems with estate agents and landlords. 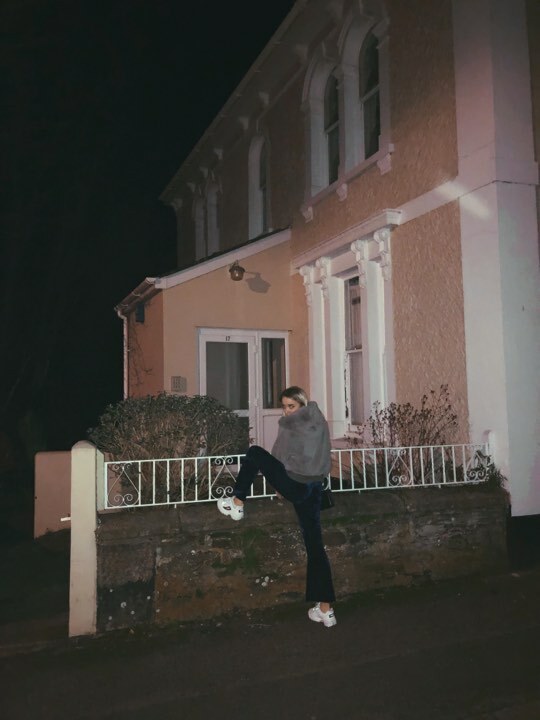 It is something that I strongly associate to student life in Falmouth – and it has become a shared negative with a large percentage of the student body. The words “whatever you do, just don’t go with Digs” is something every first year will likely hear from a disgruntled second/third peer. Everyone has had communication about their mistreatment, so why is nothing getting better? Why aren’t standards rising? The first problem I had was with my private landlord in second year. We managed to find a beautiful house which was soon to be home to eight people very close to town. I got to live with eight of my friends. It was amazing. Second year house. Not me in standing in front of it. Unfortunately, while it was super fun, the problems began quickly. In the first three months of living there we discovered that the landlord was letting himself in without any warning. The reasoning we were given for this was that the contract read that ‘communal areas are subject to inspection’ whenever he pleased. It was admittedly our initial response to believe the landlord, as none of us had read the contract properly. It only took a quick look at the document to find that there was no such thing stated in writing, and after pulling him up on this – it never happened again. I can be sure in the knowledge that a large majority of students quickly and briefly read over their fresh contracts, with many leaving that up to their parents. Second year house. 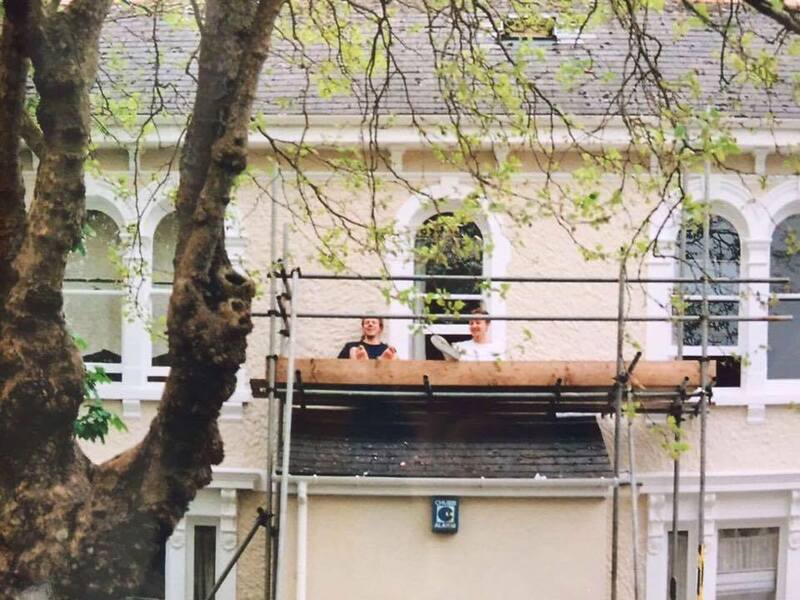 Temporary balcony. In the span of my time here, I’ve had a private landlord and two different estate agents. Out of all three of those, the private landlord, while with many problems – was the best for communication and human decency. This could perhaps be expected, a private landlord has less properties to manage and is a lot more connected with them as a result of that – but it doesn’t excuse any mistreatment. 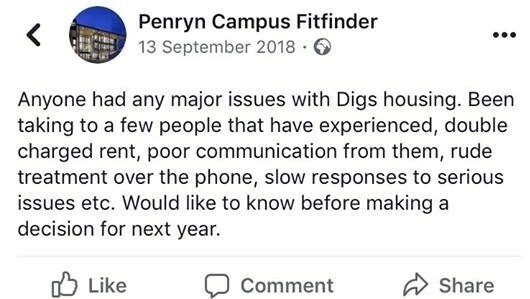 The Facebook page, Penryn Campus Fitfinder, an unofficial hub of Falmouth student commentary, is full of posts talking about problems with Falmouth estate agents. Most of these are aimed at Digs, a company that lets houses in Falmouth and Bristol. Some of the posts on Penryn Campus Fitfinder. A quick google search shows that the average rating for the Falmouth branch is 1.8. 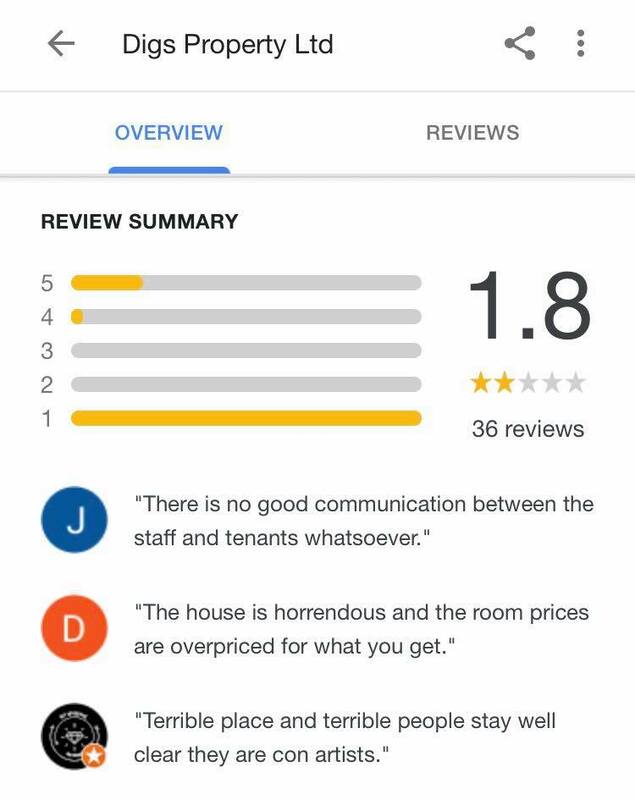 This is plastered with negatively written reviews from past tenants – focusing mainly on poor communication, rude service and overall unacceptable quality. 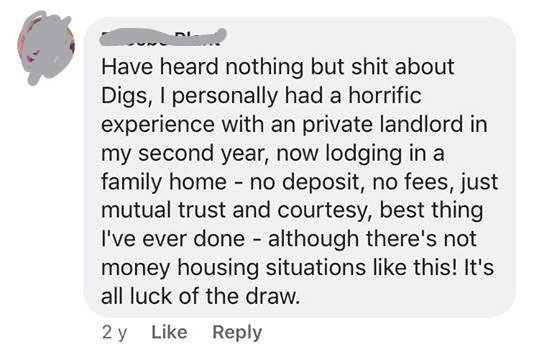 My tenancy with Digs featured all three of the aforementioned complaints. It has to be said though, that I, unlike many other students – didn’t pursue leaving a review or writing a post online. I think back now, and I wish I had done more to stand up to the mistreatment – but posts online didn’t seem to be worth it. I didn’t want to be just another angry voice. 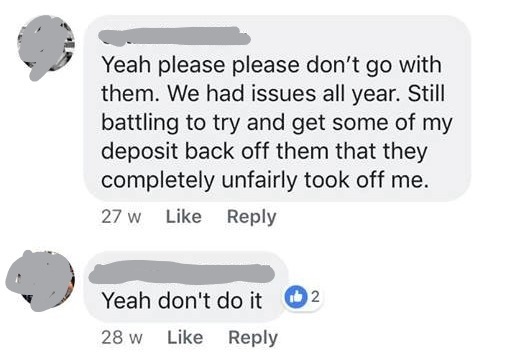 It almost seems to work backwards sometimes, with people on the web seeing the influx of angry students as a collective rather than individuals – taking away the legitimacy of each genuine concern. I do believe that the complaints are justified – I have lived through it myself. However, I think it has to be known that students need to take some responsibility for the way they handle the whole process, and there is always two sides to every story – something you can’t see in a crowd of angry online posters. Social media makes it incredibly easy to become one of an already loud crowd online and you have to stop and wonder what it’s actually achieving. I believe that it has to be accepted that things will not get better until students are more switched on to responding to issues in a maturer way. I put my hands up to the fact that throughout my University life, I have been extremely relaxed with how I’ve gone about housing. Not reading the contract being one of many obvious wrong moves. If you are complacent and mismanaged, you will receive treatment which is similar. This doesn’t make it fair by any means, but sometimes you have to realise that life isn’t fair – and people will take advantage wherever they can.